James Davies is not commemorated on the Newmarket war memorial. However his death is recorded on a Record of Service card which is held in the Flintshire Record Office. 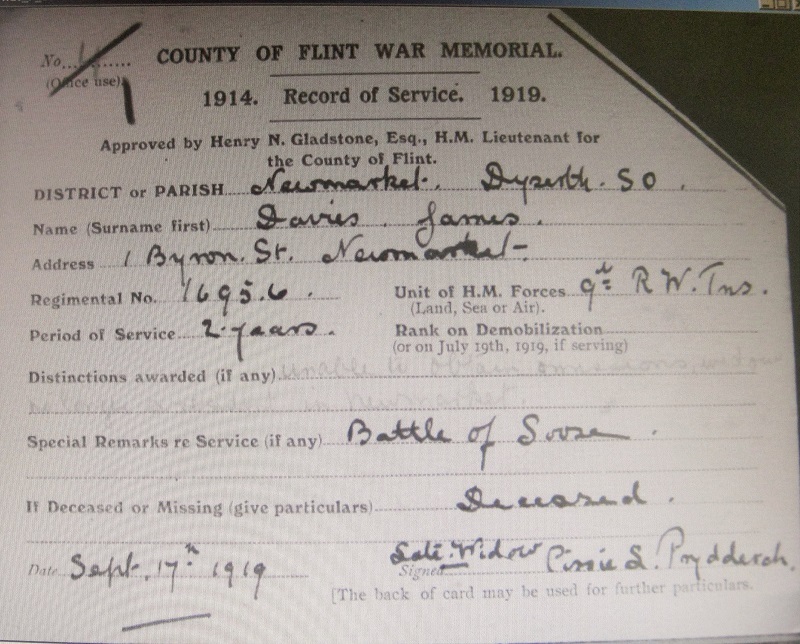 The person who filled in the card in 1919 made a mistake regarding James’ service number. They gave his address as 1 Byron Street, Newmarket and although it is signed ‘ late widow, Cissie L Prydderch’ someone has written in pencil – ‘widow no longer resident in Newmarket’. We know from ‘UK Soldiers Died in the Great War’ that James was born near Llandudno and that this is where he enlisted very early on in the war. He fought with the 9th Battalion, Royal Welsh Fusiliers and he died in action in France. On the 25th of September 1915 he was presumed dead. Along with 20,000 other men who fell in the Battle of Loos and whose bodies were never found his name is on the Loos Memorial in France. By 1919 she had presumably remarried.